1.1 How are nutmeg and mace obtained? 1.3 What flavor nutmeg and mace have? How are nutmeg and mace obtained? There are over 400 species of the genus Myristica. Of all these, about 80 are cultivated for the production of nutmeg as they have similar properties. The species Myristica fragrans provides higher quality, superior aroma and taste, making it the most widely used in cooking and as a medicinal plant. Nutmeg is a dark brown powder obtained by grating the nutmeg kernel. Other spice produced by the same plant is mace. Mace is obtained by converting to powder the dry aryl or lining around the nut. Mace, that has a reddish color, has more aroma and less spicy flavor. Its use as a spice is more appreciated than nutmeg. The use of nutmeg as a spice is very old. The Romans used it extensively in his kitchen. Today, it is part of European cuisines (Italian, Greek and French), European central kitchens (Germany and the Netherlands) and Scandinavian cuisines. Also very common in the cuisines of the Middle East, India, and the Caribbean. In India it mainly appears in sweet dishes and to Garam Massala, a mixture made with this spice, black pepper, cinnamon, cloves and cardamom seeds. In the Middle East many dishes are flavoured with it most and in Japan it takes part of the curry sauce. What flavor nutmeg and mace have? Nutmeg is a spice with citrus flavor, very aromatic, spicy and sweet. Therefore, it should be used sparingly so as its taste and its itching not to be noticed too much. It is a perfect match with cinnamon and cloves. Nutmeg and mace, or powder obtained from red aril surrounding the nut, have a similar taste and smell, but nutmeg has a sweet taste while Mace has a milder flavor. Overall, Mace is preferred when you need to color the dishes because it stains them like saffron. From nutmeg we make use of the dried berry to grate or the berry powder. We can also use the powder of the covering berry or mace. These ingredients can be added to both sweet (especially fruit tarts, chocolate, sweets, puddings and salads) and salted dishes (soups, salads, fish, stewed meat, legumes, vegetables, potatoes, rice, sauces. Worldwide known beverages where this species occurs are the following: Bechamel sauce, chicken casserole, sangria, grilled fish with nutmeg, rice oriental style Weißwurst, cream cake with nutmeg or donuts. Eggnog: A drink that is made with beaten eggs, milk, sugar, wine and nutmeg. Hot wine with sugar and spices: It is a typical drink which originated in ancient times when spices were used to flavor a wine that had become stale. By doing this, spoilt wine could be drunk again. Today it is a traditional drink in many parts of the world, but it is especially drunk in northern Italy and the Scandinavian countries. In the latter it is known by the name of Glögg and people especially drinks it during Christmas. Warm cider or “Mulled cider”: It is a beverage obtained from cider, which is heated until it reaches a high temperature without boiling. Some spices are later added like cinnamon, nutmeg and cloves and a few pieces of orange peel. Papua Nutmeg (Myristica argentea) from New Guinea, it is characterized by the silverwhite color, as a result of many abundant hairs on the underside of the leaves. 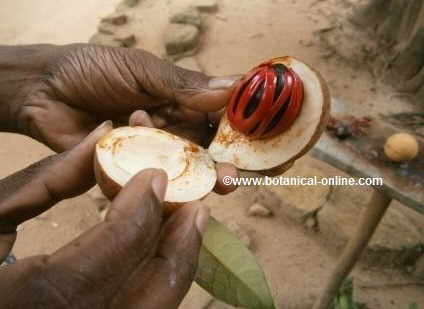 It is most often used in the production of nutmeg after Myristica fragransspecies. In herbal medicine it is used primarily to remedy the headache. 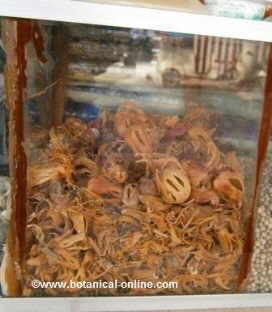 Bucumba: (Myristica bicuhyba, Virola bicuhyba): Very rich in essential oil with a very high content of myristicin. It comes from Brazil. Becuiba oil is extracted from it, with which a balm is prepared, used to rub on the body areas affected by rheumatism . It has been mentioned that this preparation could have anticancer properties. 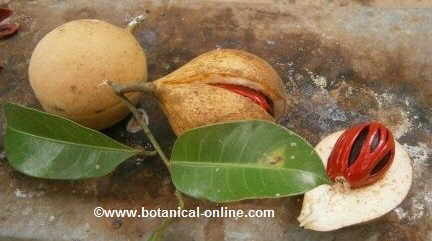 False nutmeg (Myristica fatua): Located in the Philippines and the Moluccas. Used for headaches and as an aphrodisiac. Myristica iners: It appears in Brunei, Indonesia, Malaysia and Singapore. It is used primarily as a diuretic.